It is strange how sometimes things or happenings come in threes when there is a long dry spell. It has been a while since I experience my last Saturn Return, and in the last few weeks I had conversations with three people who were experiencing theirs for the first and second time. For the person experiencing the return for the first time, there was a sigh of relief it was over, and I expected a different reaction from the other two, but was surprise it was the same sigh of relief. In my conversations with them I realized it is all the hype that astrology gives to the Saturn Return that terrorized them, rather then what they were going through. It seems to me that the experience is similar to Mercury Retrograde; it is our attitude to the up coming event that explains how we get through it. 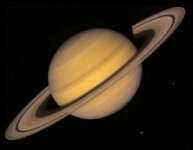 The first Saturn Return happens around twenty nine years of age, and I can see the concern one might have at that time if one’s direction and goals are still muddy and unclear for the future. The second return at about fifty nine years of age, when one wonders where the time has gone, and have we prepared enough for our golden years. I am not saying the return may not be a difficult time, but I am saying our attitude and our approach will determine how well and easy we get through it, and if we will benefit from it. I remember somewhere Isabel Hickey said that solving problems in life was not the difficulty, but the fear of the problem, was. Fear she attributed to Saturn, and fear was the culprit and the problem. Fear is the appropriate keyword for the Saturn Return, for it is not the difficulties or crisis that may prevail, but the fear itself. Fear gets in the way, not allowing for the correct solutions to come to our aid, and direct us in the right direction. In my own case, I realized if I take hold of myself without fear and to take one step at a time to try to solve the problem. The solutions tend to reveal itself and the stress and worry seems less bothersome. To understand how the Saturn Return will affect us individually, it is important to see what house Saturn is in, in the natal chart. How we see ourselves and how others see us and how we see others. What our possessions and the company we keep, say about who we are. Which direction do we take our ideas, thoughts, and spiritual convictions? Are we where we want to be and to be remember as such? Is life and our friends a banquet to behold? Are we working and doing what we love? My advice in dealing with the Saturn Return is not to fear it, but look it straight in the eye, and see it as an opportunity and a new beginning. It is the time to rethink and restructure and to build a firmer and stronger foundation to build our future hopes on. To embrace change and to realize that life is never static, but always changing and adapting. Every New Moon is in a different sign, and its; energy and message is always different, but it is always the right time to rethink what we have been doing. Do we need to rethink our direction for the coming month, or reaffirm our direction? This is the time to throw out those things that are no longer vital and to redirect our thinking to those that will benefit us. This New Moon at the end of Aquarius and conjunct to both Chiron and Neptune is indicating our healing will come through our ability to have the vision that by uniting and working together as one, will we survive. We can no longer see you and me as separate, but us as a unit in working towards a better future. The New Moon, Chiron, and Neptune are entering into Pisces where Venus is conjunct Jupiter inspiring faith, trust, consideration and compassion with humanitarian efforts for the world. Aquarius 26 A hydrometer This is a symbol of the powers of immediate analysis which enable man to achieve his commonplace or practical goals. Here he has full assurance of an intelligence and order to be found throughout the world of everyday realities, and he comes to see that a very real cooperation of natural conditions and forces may be enlisted for any project of special concern. The individual learns that when he will take responsibility for events he may shape them to his own convenience, and thus find ways to capitalize on any difficulties that arise. The keyword is efficiency. When positive, the degree is exceptional ability in manipulating the fundamental complexities of living, and when negative, self-defeating worry over trifles. What I find very interesting with this New Moon is that it begins right before Valentine’s Day and the start of the Year of the Tiger. As a child in grade school, Valentine’s Day was where you told the whole school who were your best friends and those you wish to socialize with. It was what you might now call the social networking of our time. As we got older we realized this day was for your sweet heart or sweet hearts. With this Aquarius New Moon it is telling us we need to social network and work for the good of the whole. The Sabian symbol is telling us to use all the modern conveniences like the blogs, Twitter and Face book to mobilize for the good of the whole. At the same time we need to take responsibility for our decisions, actions and how it affects us individually and as a global society. The message of this New Moon is that we can no longer think of me, but as we, and we need to welcome Aquarius with open arms as the sign which brings innovation and friendship into our lives. Although I am interested in politics as the next guy, I am usually more concerned with the local happenings that are affecting the state I live in, but the last two to three weeks the commotion about Martha Coakley has caught my attention. Three of the astrology egroups I am in, have been buzzing about how close the election has become and their interpretations were hedging on the fence like the political experts that were involved. Although most of the astrology experts expected Brown to win, they weren’t going to give up on Coakley, as it appeared too close to call as far as the stars were concerned. My favorite method for forecasting is solar and lunar returns, and as I read the different discussions on the matter I realized that the return may be expressing what might be the general all over situation for the month, but would not exactly state what might happen on Election Day. As I thought over all that was said, I realized using their train of thought, I too would be hedging, but leaning towards Brown. Then I started to remind myself of the astrologer Dymock Brose, who is an expert on Harmonic Age Interpretation who forecasted the elections of several foreign politicians correctly, that were too close to call. I am still trying to master the method of Harmonic Age interpretation, but I thought I would set up a chart for each candidate and see what would turn up. I was amazed that the winner jumped off the page, and I think this was because this event was really major in both candidates’ lives. I have been experimenting with this type of interpretation in the last year and half as the financial downturn fell upon us with fellow coworkers that were transferred and those who have lost their jobs. For each coworker, the day in question when the decisions were implemented, the aspects were within sixty seconds in the same minute. This I found very interesting and I realized whether it was a benefic or malefic aspect it had to be within the minute to make a difference. At first I could not find the birth data for Brown, so I set up Martha Coakley’s Harmonic chart for January 19th 2010 for 5:00 p.m. Pacific Standard Time. 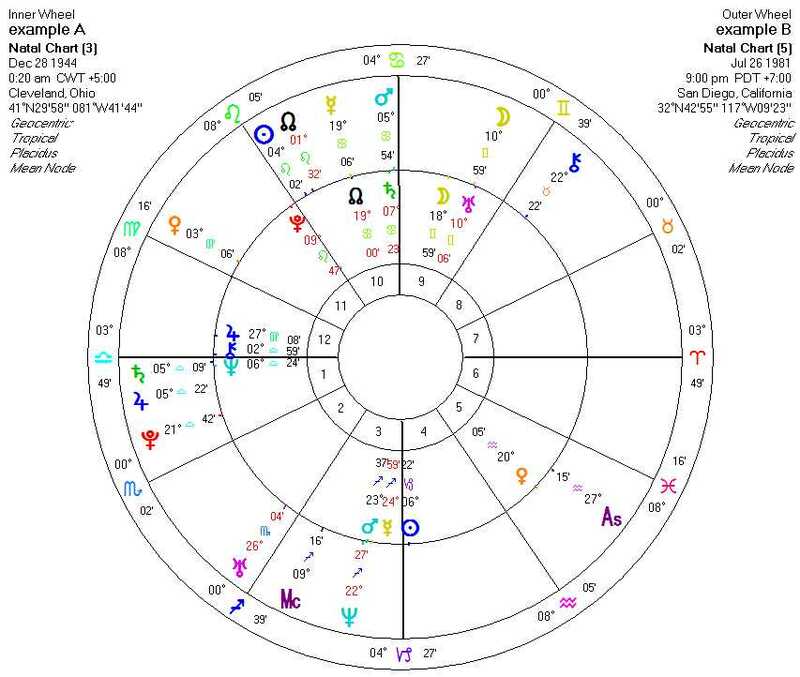 Mars in the twelfth House was square Mercury in the ninth house, and Jupiter in the sixth house was square Saturn in the third house and at the same time was sextile the Moon in the fourth house. The two malefic aspects were closer then the one benefic for which I concluded that Brown would be the winner. The aspects seem to tell me that the candidate was not able to communicate her position to her constituents, and she did not understand the needs of the people she was to represent and did not have the ability to organize an affective political organization or campaign. I still was not happy with the results because I was not comparing the two candidates’ charts together which would make me happier if I was to make a prediction of who would win. 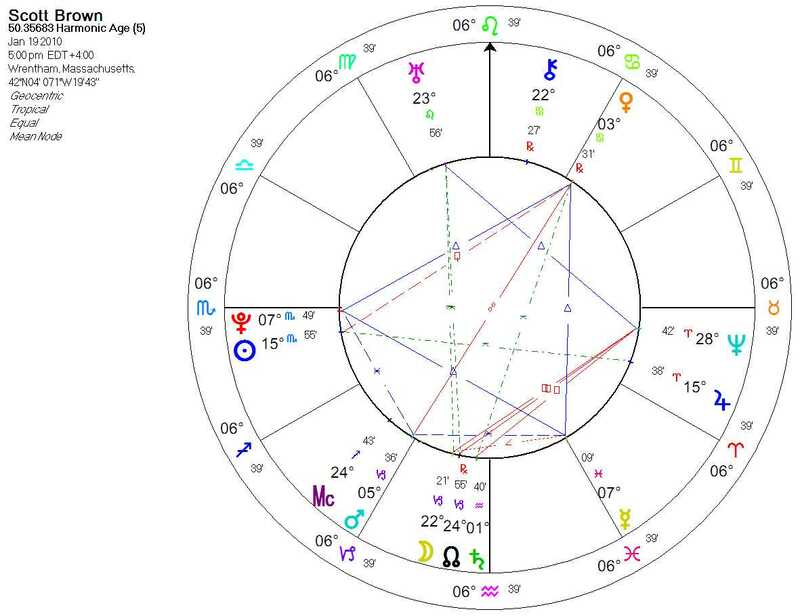 Finally I ran across a post that compared the two candidates’ sunrise chart, since the birth time was not known, which I thought would be a good idea to test the Harmonic Charts and if it could predict a definite outcome. To my surprise, it did show Brown the definite winner. In Browns’ chart Pluto on the ascendant trine Mercury indicates his ability to reinvent himself and his ability to organize a following. 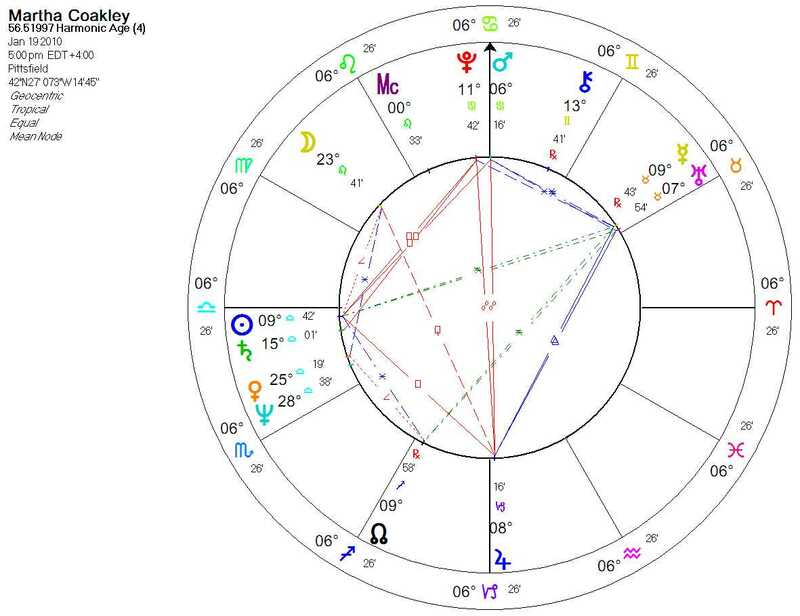 In Coakley’s chart the Sun sextile the North Node which I have seen in other charts that doesn’t seem to do or say as much. At the same time the Sun is square to Jupiter which might indicate her inability to see her short comings and to accept the results of her previous actions. The results of these two charts, only confirms my interest in the study of the Harmonic Age chart as another tool for prediction. As I was explaining to a coworker that I use astrology to guide me in my choices in life, the expression on his face was that of fright and Horror. I realized from our chat that he felt he didn’t want to know the future, and that he would rather experience it as it happens. His thoughts on astrology only confirmed that his life was destined and that he had no choice in the matter, any way. This made an impression on me, as I have always felt that I do have choices in the direction my life is taking. Yes it is true, there are things I can’t change, but how I experience and direct what is given to me, is still my choice. I think that I would rather know what might be in my future, whether good or bad; then be in the dark. So at least, I can make the decision of what I want to keep and what I want to discard in my life. Thinking about this, I wonder what I would say to a potential client on how to prepare for an astrological reading and what mental attitude that would be needed to get the most benefit from the session. My first thought was to remind the person that although astrology may indicate what might happen, the choice still remains with the individual. 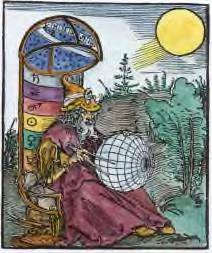 One of my main concerns in reading some one’s chart is that I am only giving an indication of what is on the horizon, but that the individual still needs to be responsible and make his own choices, and not depend on some one else to do his thinking. Checking my own chart, I realized that I needed to be honest with myself, to what I really wanted to know and how I would accept information, which went against what I hoped for. I knew what I wanted depended on what I was willing to hear, and that, I heard only what I wanted to hear and know. This made me feel, if we are to receive any benefit from foreknowledge of the future, we must be honest with our selves and in the right attitude to use this information that would benefit us. I also needed to be responsible for my decisions and choices and to comprehend what is being said. I have noticed in my work that people are only hearing what they want to hear. Most of the time people aren’t listening to your response, but thinking of what they are going to say to you next. If one is going to have real communication one needs to really listen to all that is being said and the need to comprehend the meaning of it. The problem in reading one’s own or another person’s chart is honesty of what we really need to learn to know about the future. Looking at one’s own chart, one needs to look at it with an objective eye and allow the chart to unveil its’ story. So going back to what one needs to tell a prospective client, is to decide what one is really seeking to accomplish and come up with the questions prevalent to that search. Not to confuse the session with unrelated questions to the main intention, but to see which one of our talents and assets would achieve the desire end. If the reading is just to see what the major issues that are forthcoming are, try to be open minded, even if it sounds totally unbelievable. Many times the answer may be negative, but instead of accepting a no, understanding why it should not be in our future will be a positive step for us to be able to change our direction and thinking. Time and time again the answer of what we really need is in the chart, if only we would be honest to ourselves that we may not know what is right for us. The chart does not predestine our lifestyle, but allows us to make choices. Being informed of the future allows us to create our own world as we see fit by allowing ourselves to accept or change what might be in store for us in the future. We must remember that although something is promised in a chart, the individual still must work for it, to achieve the end results. For example the chart may show an individual is talented in acting and would achieve some acclaim, but the individual still must put the effort in and pay his dues to receive his rewards. The final analysis of an astrological consultation is to be forewarned, hence one is forearmed, and what a better way to enter into living our life to the fullest. Every time the Full Moon comes around, our thoughts of where we have been, comes to the surface and we must decide if the path we settled on, took us to where we wanted to be, or must we again make changes and improvise to get to the destination we wish to attain. The Full Moon on January 29th – 30th 2010 at 11th Degree Leo at 10:18 PST indicates a need to deal intensely with change that will bring us together as a unit and yet as individuals for the good of all humanity. With Saturn square Pluto following at the heel of the Full Moon, structural rebuilding and regeneration with a hint of playfulness and joy is the keyword to develop the ideas that will create the needed improvements as we deal with the situations we are facing. 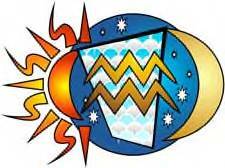 With Venus conjunct the Sun we need to make those changes in the way we see the world and how the world sees us. Pluto may want us to start from scratch, but Jupiter is telling us to pick up the pieces and work them into something everyone can understand and benefit from. “The Sabian symbol for the Moon in 11 degrees of Leo and for the Sun in 11 degrees of Aquarius is taken from “The Sabian Symbols in Astrology by Marc Edmund Jones”, and what follows are my comments. Aquarius 11 Man tête-à-tête with his inspiration This is a symbol of satisfaction in the transcendental experiences of selfhood, and of a new realization that each individual lives in a consistent intimacy with spiritual verities of every sort and on every hand. Implicit in the symbolism is the need to act continually in personal self-interest, and to translate every vision into practical consummation. As man accepts the over-shadowing of a universal life and order, he must demonstrate his own special capacities and rededicate his own individual achievements. The keyword is ecstasy. When positive, the degree is an enthusiastic idealism and a tireless desire to serve others, and when negative, complete self-obsession. Until we become like little children with innocence, joy and delight and see through their eyes, and only then, can we appreciate life for what it is. Through their eyes and with there complete trust with Universal direction, they create the world they wish and seek. The American Heritage Dictionary gives the meaning of ecstasy as intense joy or delight. If we can allow ourselves to be like little children with an intense delight in life, we will be able to create the world we so ardently desire for ourselves and for the world as a whole. So use this period of time to live life intensely with joy and delight, knowing only good and greatness can come from this. One of the greatest lessons I learnt in my journey through life came early through a mentor who taught me if I am to ever be successful in life and in any career I needed to be observant to everything, especially of those involved in my life, and the events around me. He made me observe people in how they ate and to their body language, and then try to come to a conclusion of what their lifestyle would be like and their possible needs in this world. This observation has become second nature to me, and I noticed that two of my co-workers who are managers were so attuned to each other in their work habits that I wonder what I would find comparing their charts. To my surprise and delight there was six conjunctions of the planets, that made them think so alike, it would be hard to tell where one began and the other left off. Was this the kind of chart that would make for a Happy Ever After Ending, in a way yes, and in a way no. As a work team these aspects would make them hard to beat, and if given a free hand would be able to come up with successful solutions sooner, as they thought as one. If this was a love relationship with passion in tack, it would be a prince and princess fairy tale story with a happy ending. I began to wonder what would change, or what would be needed to take a real friendship or work association into a love relationship? As I began to think over the matter, I realized it was not only the timing, but the outlook and the attitude of the individuals involved. I came to the conclusion that each individual needed to go through and pass the excitement of passion and sexuality of a relationship into the realization of what keeps a union together. When we realize that a relationship is more then passion and excitement, then we go to the next stage in building towards a future in living together in harmony. This is where the conjunction of the planets comes into play, and makes our ability to be attuned to each other, a passionate and exciting tool to build on. The conjunction is like Mercury, neutral until it aspects another planet. The conjunction assumes the role of sympathizer and empathizer with the planet that it is conjunct with. As I have said before it is like two people standing side by side, we feel one another and are strengthened and energized by their support. If the conjunction aspects another planet it may indicate a possible love connection, then the potential is there. When the progressions indicate the event, it may be possible for it to become a reality. I say possible, as I feel that we as individuals still have a choice in the matter. This aspect makes great work partners as they are attuned with one another and are able to still have their own point of view, and because they are able to be sympathetic and empathetic with each other, they can quickly compromise to make things work the way they want, to have a successful undertaking. In my opinion, what makes a successful relationship, whether it is business or love, is the ability to feel attuned with and trustful of the other person involved. The conjunction of the planets involved, whether it is two benefic, malefic, or one of each, is the trust that each will do its part in the aspect. Trust is the keyword that we can expose our real self to another individual to encounter their sympathy and empathy and to build a relationship with a firm foundation for a lasting future. So when the passions have subsided, remember to look for the link and construct upon the connection of the conjunction to building a future together. One last thought is that any relationship, no matter how successful the stars say it will be, all relationships need to be worked on to come to the successful end like the fairytales foretell.